Now is an hour past midnight and here I am typing away this post. 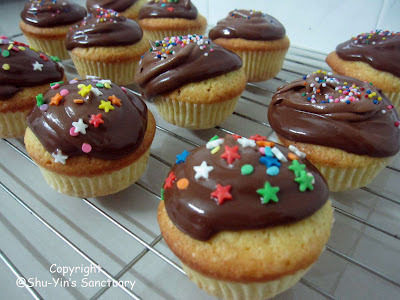 Just about 2 hours ago, I suddenly felt like baking these Yellow Cupcakes with Chocolate Frosting. So after putting Shern to sleep, I whipped out these beautiful yellow cupcakes in less than an hour. This recipe from Joyofbaking is simple. Just dump all the dry ingredient into the mixer and then add in all the wet ingredient and then beat them together. Takes you only 15 minutes or less to do so. 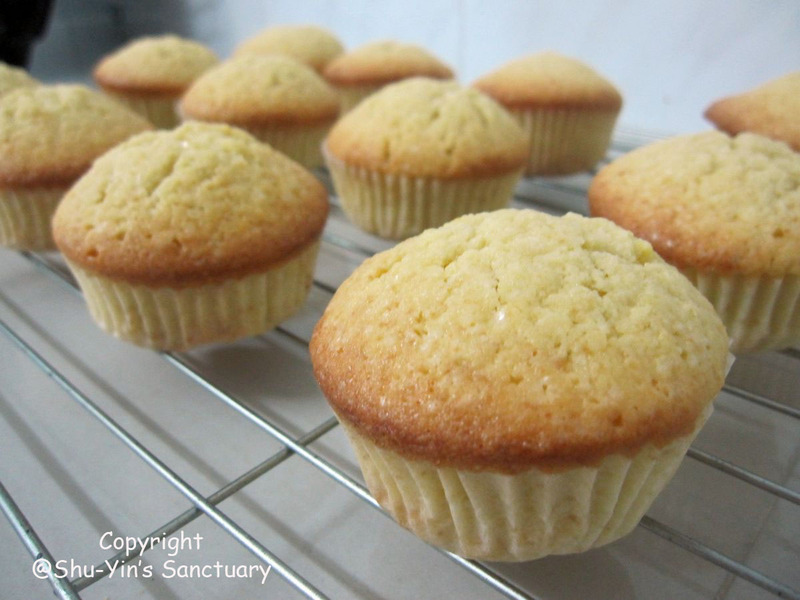 Then bake them in the oven and 30 mins later, you get these beautiful yellow cupcakes. While the cupcakes were baking in the oven, I made the Chocolate Frosting. Being me, I tweaked the recipe a little. I did not have bittersweet chocolate, so I used semi-sweet. I reduced the icing sugar and I used less butter because I ran out of it. End results? My Chocolate Frosting was too runny and not thick enough. Sigh. Added in some colourful sprinkles to make them fun! Notice some of the Chocolate Frosting dripping down? And Shern will be having them for breakfast tomorrow. Evenly fill the muffin cups with the batter and bake for about 20-25 minutes or until pale gold and a toothpick inserted into a cupcake comes out clean. Remove from oven and place on a wire rack to cool. Once the cupcakes have completely cooled, frost with icing. You can either spread the frosting on the cupcakes with a small spatula or, if piping, use a large Wilton 1M open or closed star tip to make lovely swirls. These cupcakes are best the day they are made, although they will keep for a few days at room temperature. 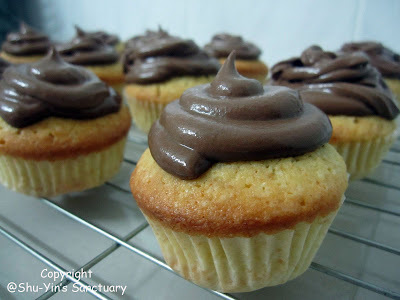 p/s - The next day, the Chocolate Frosting hardens, which makes it more easier to handle. However, I find that the Chocolate Frosting turned sweeter the following morning, I wonder why?